Zubron were first developed by Leopold Walicki in 1847, although the hybrid may also have appeared at an earlier time. After World War I, various scientists considered Zubron a possible replacement for domestic cattle. Zubron turned out to be more durable and less susceptible to disease. In addition, they could be bred on marginal grazing land with no farm infrastructure and with minimal husbandry in huge state agricultural farms (SAFs). Up to 1958, the work on zubron herds was continued by the Polish Academy of Sciences in various laboratories, mainly in Bialowieza and Mlodzikowo. During the first 16 years of experiments, a total of 71 animals were born, including Filon, the first zubron born to a zubron mother (August 6, 1960). The animal was intended to become a hardy and cheap alternative to cattle. The experiment was continued until the late 1980s, when the results of the breeding programs were deemed unsatisfactory. Various factors contributed to this decision, including the severe economic difficulties of the Polish socialist economy in the 1980s, a lack of interest from the notoriously ineffective SAFs, and fears that zubron would crossbreed with the endangered wild wisent, contaminating their gene pool. The two notable centers for experiments on the species were Lekno (391 animals) and Popielno (121 animals), while limited experiments were also held in the reserve of Askania Nova in the USSR. 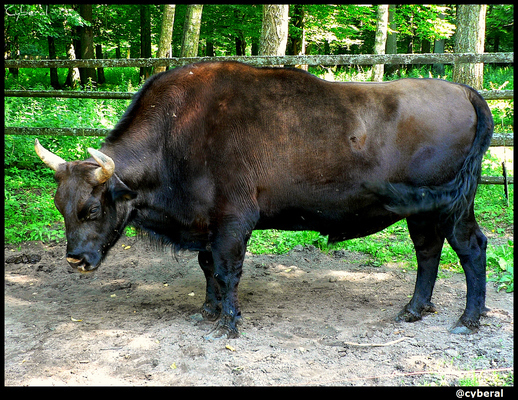 This was discontinued, and the sole surviving herd consists of several animals only, kept at Bialowieski National Park.